We’re offering FREE home-based HIV tests to those who qualify and have a mailing address in Rhode Island. Just click the button below to answer a few quick questions, and we’ll mail a test kit to the address in Rhode Island you provide within 5-10 business days. You can also learn more about how the test works below, too. What is home HIV testing? The new OraQuick In-Home HIV Test is a rapid HIV test that uses a sample of the fluid in your mouth and provides results in 20 minutes. The test is very easy to use and comes with thorough instructions. How does the home HIV test work? 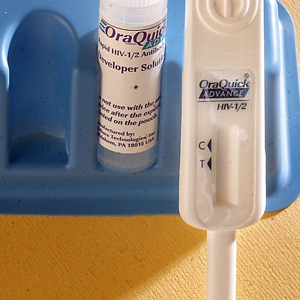 The OraQuick test detects whether there are HIV antibodies in your mouth, which are proteins that your body makes to fight HIV if you have been infected. While the test is very accurate, it usually takes your body 14-90 days after being infected to make antibodies. So, if you think you may have been exposed more recently than that, the test may not produce accurate results. Our HIV testing clinic or your doctor may be able to conduct a test that detects HIV directly. What do I do if my results are positive? If your home HIV test results are positive, it’s important to follow up with a doctor as soon as possible. Healthcare professionals usually conduct two tests to confirm that you have HIV, so the results of this test are preliminary. Please call The Miriam Hospital Immunology Center at 401-793-2928 and ask for Dr. Philip A. Chan, or email pchan@lifespan.org. If your second test is positive, your doctor will typically start you on anti-HIV medications right away. While HIV is serious, if you take these medications every day and take care of yourself, you can live a life that is just as full and active as someone who does not have HIV. Visit our page HIV Positive? Get Treated page for more information and resources. How can I get a home-based HIV test? For a limited time, The Rhode Island STD Clinic and the Rhode Island Department of Health are offering to mail a FREE home-based HIV tests to those who request it and who have a mailing address in Rhode Island. Just click the button below, and answer a few short questions. We’ll send your test to the address you provide in 5-10 business days.